I have completed my class, “Working In Series” taught by Elizabeth Barton. It was really interesting to watch the development of quilt series by all the students. As in most online classes, only a few students actually carried through to complete a series. In some instances, this was because the students had selected a complex topic. 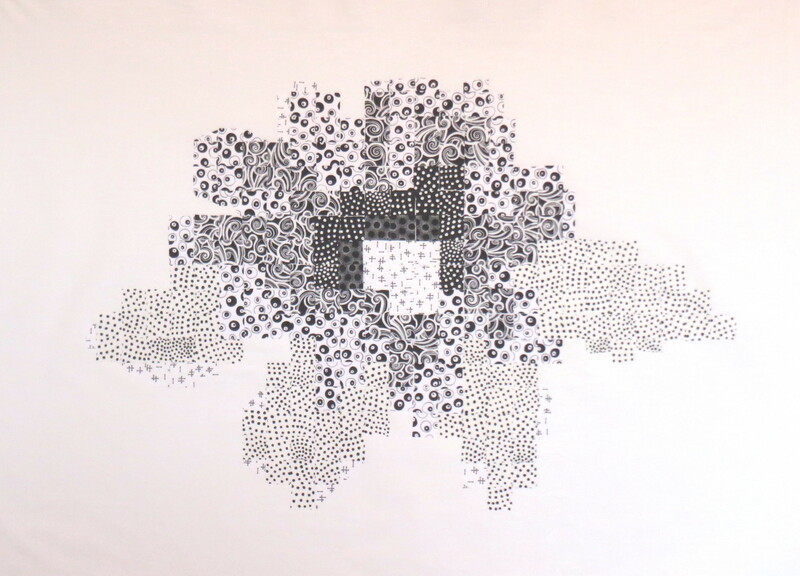 Those of us who chose simpler abstract shapes — or a small flower, in one instance – were able to finish the process. Students who chose topics such as a series of landscape quilts or quilts based on buildings had much more work to do to develop their series and were not able to finish within the time frame of the class. I posted earlier about using watercolor pencils for quilt design. 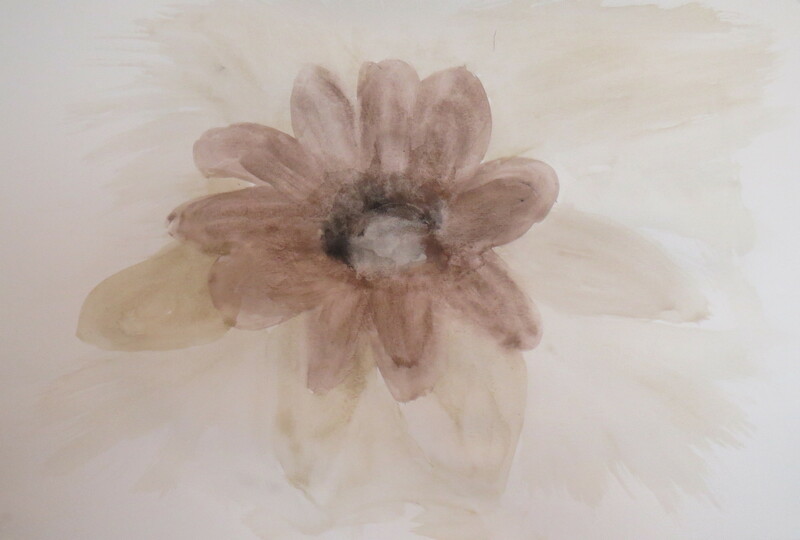 Following that exercise, I purchased a small set of tubes of watercolor paint and painted some simple large flowers. We were instructed to use black, white, and gray to make a value study and then paint others in color. I am only going to present the value study here. As you will see, I have no skill at painting! Using this value study, I drew a grid on top of the watercolor painting and assigned a “value” to each square. 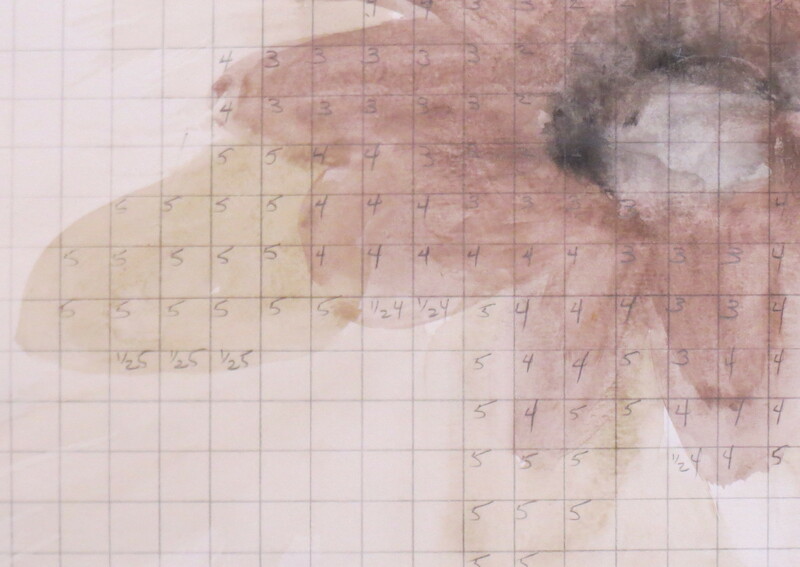 The photo below shows a closeup of the grid and numbers. I ended up with seven different value numbers. I grabbed some black and white prints from my stash with a range of values from light to dark, and selected seven of the fabrics. I cut a rectangle from each fabric and put a fusible web on the back. I then cut one inch squares from each fused fabric, keeping the each fabric in a separate numbered pile. A grid was drawn on a piece of white fabric (one inch squares) with an iron-away marker (Frixion pen). The squares of black and white fabrics were placed on the piece of white fabric, matching the numbered squares in the original design. Once all the fabric squares were in position, I ironed the pieces down. The following photo shows the result. I doubt I will ever turn this into a quilt, but the process is used by some quilters to make spectacular quilts from photographs (such as very large portraits) where the color and value of each small area of a photograph is matched. Once the fabrics are selected, the process is very methodical. This entry was posted in Art Quilts, Contemporary Quilts, series quilts and tagged mosaic quilts, value study, watercolor paints on May 10, 2014 by Shirley at Mystery Bay Quilt Design. So subtle and delicate — beautiful work!